All recycled materials are sorted by colour to avoid the use of extra dye. The bottles are stripped of their labels and caps, washed, crushed then chopped into flakes. These tiny pieces are melted and extruded to cease fibre. The fibre produced is crimped, cut, drawn and stretched into fabric. 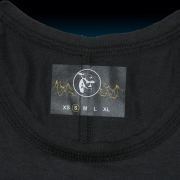 The fabric is then used to create a great looking and feeling raw edged long sleeved T-Shirt. Ethically produced short sleeved T-Shirt featuring the Fish People emblem - made from 50% domestic organic cotton and 50% recycled plastic PET bottles. 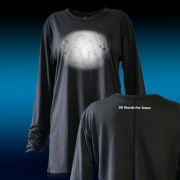 Ethically produced long sleeved T-Shirt featuring the Misty image from 50 Words For Snow - made from 50% domestic organic cotton and 50% recycled plastic PET bottles.